These gorgeous seed packets came to my attention via Gardenrant.com, and is the cool product of the wonderful guys at Hudson Valley Seed Library. Since it's seed season, and this art is prettier than anything I've seen since Victorian plant packets, I thought I'd hijack them for my reader(s). Feast your eyes, then order some and plant 'em! I had the japanese maple and the pin oak pruned last week, and this week I got these little fuzzy maple flowers. The gorgeous photo below of forced muscari in a teacup is not mine, but I must share with you. Sans kind permission of the wildly informative and touching blog "Spitalfields Life." 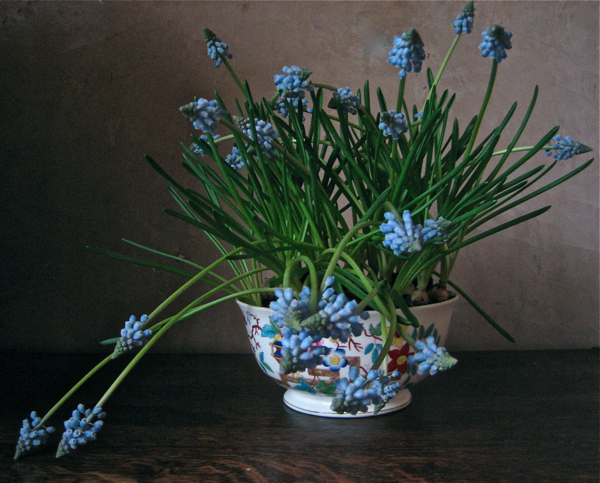 These grape hyacinths are from the Columbia Road market, London. If Stanley Kowalski had been from Boston, not New Orleans, would he have yelled "Stellar!" ? ?